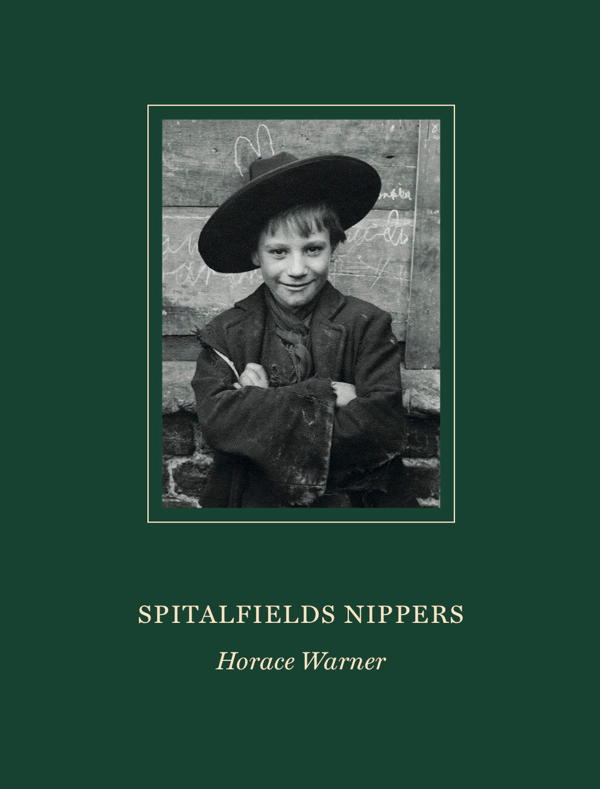 Over recent months, I have spent a lot of time studying the photographs of the people who lived in the yards beside Quaker St that Horace Warner took around 1900, in order to write my introduction for the book of Spitalfields Nippers which is to be published on 1st November. The sharp focus of these pictures permits me to examine them closely and they reward attention because the plethora of detail can reveal unexpected things. 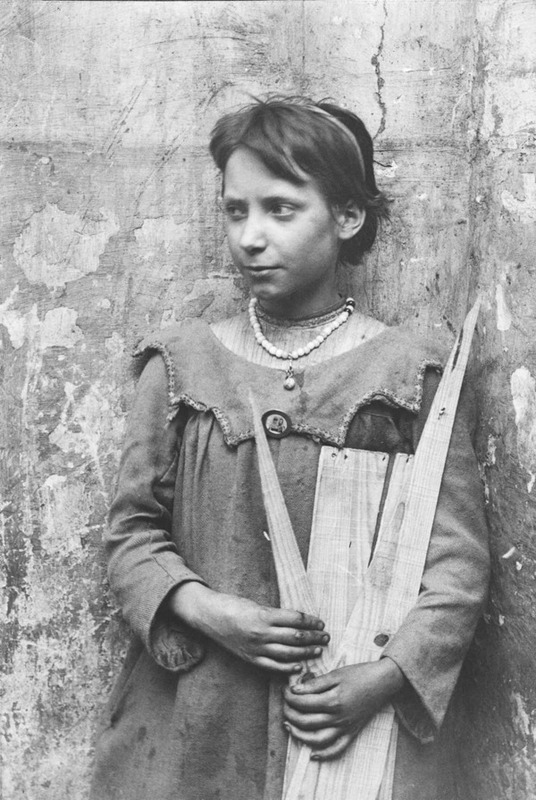 I especially like this photograph of a girl holding scrap timber. It fascinates me that her clothes and jewellery demonstrate such pride in her appearance, even while her hands are dirty and she is collecting firewood. It is obvious that Horace never asked his subjects to smile, instead he granted them the space for self-possession and she presents herself on her own terms, with composed equanimity and preoccupied in her world. I am fascinated by the variety and individuality of clothing in Horace’s photographs, which belong to an age before the industrialised mass-production of clothes we know today. These were garments that went through many owners, handed down through the family, altered, patched and refashioned until they fell apart. The ancient Houndsditch Rag Fair existed just a mile to the south, until it was closed permanently to prevent the spread of smallpox, and this may explain the presence of so many elaborately-detailed garments in antique designs – such as the dress in this photograph – which could have been acquired cheaply in the market and cut down to size. 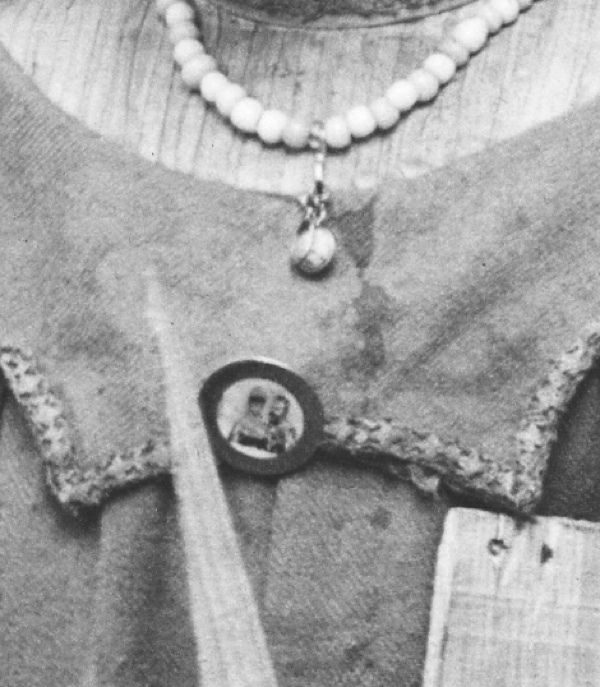 In particular, I grew curious about the badge that this girl wears upon her decorative collar and, in close-up, I could see that it was King Edward VII & Queen Alexandra. Another of Horace’s photographs show boys holding up newspaper hoardings announcing the end of the Second Boer War in June 1902 and, since the Coronation of Edward & Alexandra took place in August 1902, this gives us an indication of the date of this photograph. Imagine my surprise, when walking through Spitalfields Market, to see just such a badge – slightly different because it shows Alexandra without Edward, but in all other respects the same and around the size of a pre-decimal penny. My pal Bill, whose stall it was, told me that they were given away free at the time of the Coronation. 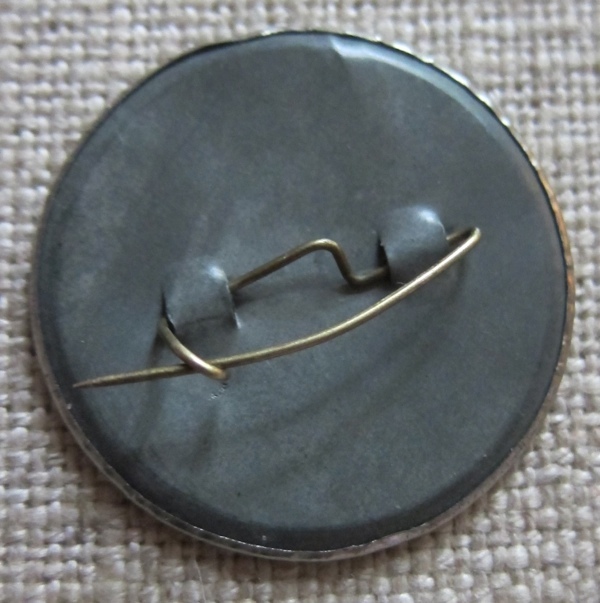 “It’s such a cheap thing, just a scrap of paper stuck on a piece of tin, that it’s amazing it has survived,” he said, holding it up to examine it. When I told Bill the story of the badge in the photograph, he presented me with it as a gift and I agreed to bring him a copy of the book in exchange in a few weeks time. When I read about Alexandra, I discovered that she had a scar on her neck from an operation that happened when she was a child, which led her to wear high collars and elaborate necklaces. Consequently, this style became a fashion and, when I looked back at the photograph of the girl, I wondered if she was trying to emulate Alexandra in the way she wore her necklace over the dress with its decorative collar. 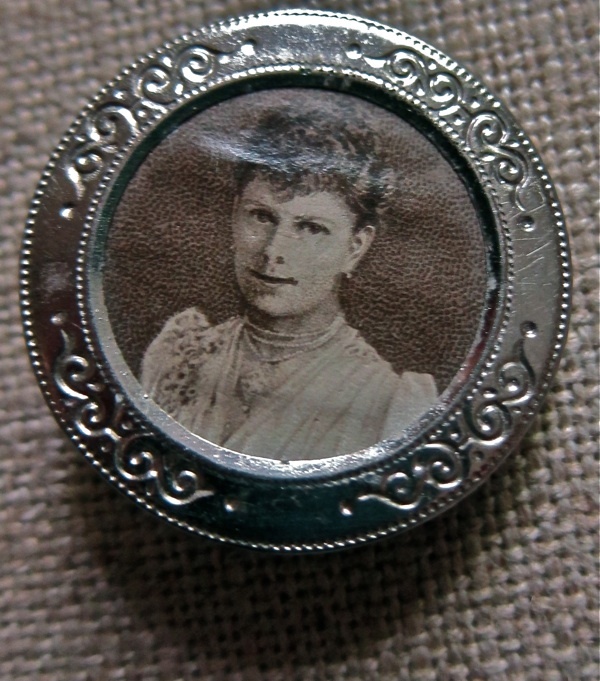 If it were not for Horace Warner, I should not have looked twice at this old tin badge in the market but, thanks to his photograph, it has become a wonder to me. The reverse of the badge. This is my pal Bill, a dignified market stalwart who deals in coins, whistles, badges, gramophone needles, souvenir thimbles, magic lantern slides, trading tokens, small classical antiquities and prehistoric artifacts. “I sell quite a few things, but on a low margin because it’s more interesting to have a quick turnover.” he admitted to me, speaking frankly, “I’m here more for enjoyment really – quite a few friends I’ve made over the years. I was a shy person before, but it’s made me confident having a stall. 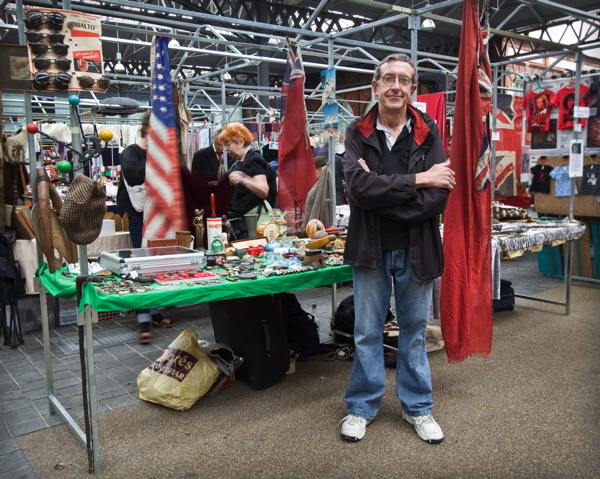 I’ve become an optimistic person.” Bill comes to Spitalfields each week with all his stock in a backpack and large suitcase – practical, economic and an incentive to sell as much as possible. What a find ! Real treasure , that badge was meant for you . Wonderful to know that it now has a good home with somebody who will appreciate it. Thank you for all your wonderful posts. I’m sure others have mentioned it–I think the badge you were given is a photo of Queen Mary when she became Princess of Wales when Edward and Alexandra became King and Queen. She was very popular and it makes sense she would have a badge. She also wore the high collars and “dog collar” necklaces that Alexandra popularized, and continued to wear Edwardian styles long after fashions changed because that is how her husband, George V, preferred to see her. really interesting research and observations, will help me read my copy of Nippers with more knowledge of the times. Looking forward. Stunning photo of the girl. Good Morning, I love your blog and have been getting it for a few years now. I live in Canada and may never get to England so I love your pictures and the history and the tours around your neighbourhood. Anyway, I love the history of the Royal Family and have looked at a lot of pictures of Victoria and her decendents and I think the badge you found in the market may actually be a young Queen Mary, Queen Alexandra’s daughter in law. Thanks for such a great blog, you are one of my favorites. Her face I find most interesting – a serenity, not smiling but untroubled. What were her thoughts ?. She has got me thinking. Just to write that I enjoyed this post very much. As well as the badge I was very struck by the girl’s scalloped smock collar. Very unusual and appealing. Glad you happened upon a similar badge, as makes what you’ve studied and found interesting all the more tangible in real life. Once home from my holiday will be ordering the book. I have to say I also think it might be Queen Mary, or the Princess of Wales as she became in 1901. …. thank you for this lovely article to reflect upon …..
What a fascinating post, I’m so pleased I called in today. Barbara. Adelaide Springett was the my grandfathers sister. I think that makes her my Great-Aunt. What a lovely picture of her. I had no idea she existed until now. Must buy the book! Good Morning from the USA, Childhood rends tears apart the child who grows into a young adult, leaves very little of the innocent self. My hero is Elie Wiesel.